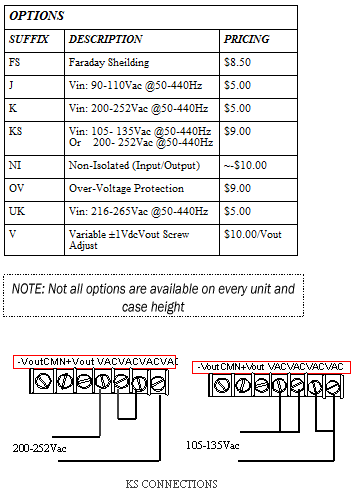 Give the complete model number including voltage, current, mounting preferences and any desired options. Give complete shipping instructions. Including telephone number. A purchase order is a binding contract and a cancellation must be initiated before work is started to avoid cancellation charges. To return a product, call AAK for a Return Material Authorization (RMA) number and shipping instructions, otherwise, product will be returned and entail a considerable delay. Warranty will be void on any unit retuned to AAK that has incurred cosmetic damage before or during the return process. AAK Corporation warrants all its products are free from defects in the manufacture or material for One (1) year under normal operational conditions from date of shipment. Replacement of a defective unit shall be made under terms of this warranty provided operation of the device is in accordance with the given specifications. Warranty is rendered void if the product is altered, opened, defaced or is defective due to acts of God, failure to follow instructions or to provide safety devices (example: over-voltage protector,fusing,crow-bar). AAK is not liable for consequential damage resulting failures or misuses of its products. Under no circumstances shall liabilty exceed the purchase price of the product. This warranty is limited to the repair or replacement of the defective unit. AAK Corporation warrants all its products are free from defects in the manufacture or material for 1 years.